Can You Diet and Gain Muscle? When it comes to building muscle and shredding fat, you’re often told that you need to make a decision – one or the other. You can’t gain muscle mass and drop fat at the same time. This is based around the idea that in order to build muscle you have to eat more calories than you burn off, and to drop body fat you have to hit an energy deficit. So at face value it makes sense, right? In this article we take a look at the research behind body recomposition – simultaneous increases in lean mass while cutting fat, and tell you not only why it’s possible… but how. It’s the golden chalice of training. The holy grail. The elixir of exercise that everyone wants to achieve – being able to develop lean, athletic muscle while at the same time shredding fat and carving out some well-defined abs. Changing the way your body looks will all come down to the way you train and the calories you eat. Get this right and you’ll find that you progress much quicker than you ever have. Your body is hardwired to store excess calories as body fat. It’s a natural side effect of evolution. In evolutionary timeline terms, it’s 5 minutes since we were loincloth wearing cavemen and women. Your body actually still thinks it’s on the Savannah, hunting for food and unsure where the next meal is coming from. If you have excess food available, your body will want to store a little extra for later – just in case you have to miss a meal or two because you don’t catch the animal you’ve just been hunting for the last few hours. It’s a safety mechanism to stop you from starving. The bottom line is that eating more calories than you need will optimize muscle growth, but at a cost. You will start to sore excess fat. The more energy you have spare, the more your body will allow you to use those building blocks to manufacture some new muscle cells. But you’ll also manufacture fat cells too. Unless you know how to ‘recomp’. Body recomposition isn’t for everyone. It’s not easy and it takes dedication and patience. But for those willing to give it a go you’ll need a few guidelines to follow. Without these you run the risk of missing your targets altogether, ending up with either a lean but skinny frame, or a muscular but overweight physique. The number one rule when it comes to dropping fat and gaining lean muscle is that you have to achieve a calorie deficit. If you don’t then you just won’t burn fat. How low can you go with your calories? That’s up to individual tolerance. A standard deficit is around 20% from maintenance calories (that’s usually around 500 kcal per day). However, research has shown that aggressive ‘rapid fat loss’ dieting with deficits of 40% also work well – as long as you can stick to it. It’s hard, but guarantees results if you can adhere to it properly. Strength training during dieting helps you maintain muscle mass by elevating muscle protein synthesis – the rate at which your body replaces lost muscle cells and builds new ones. The emphasis should be on heavy, compound exercises. Because you’ll be in a deficit and energy levels won’t be as high as they normally are. It’s not the time for intricate and long, drawn-out and high volume sessions. You’ll just deplete your body even more than it already is. You’d be constantly tired and you’d run the risk of overtraining. By lifting heavy and using exercises that focus on multiple muscle groups you’ll stimulate muscle protein synthesis and even retain (if not increase) your strength – even when on a weight cut. And you’ll be able to do this in 2-3 sets per exercise. What type of exercises should you include? 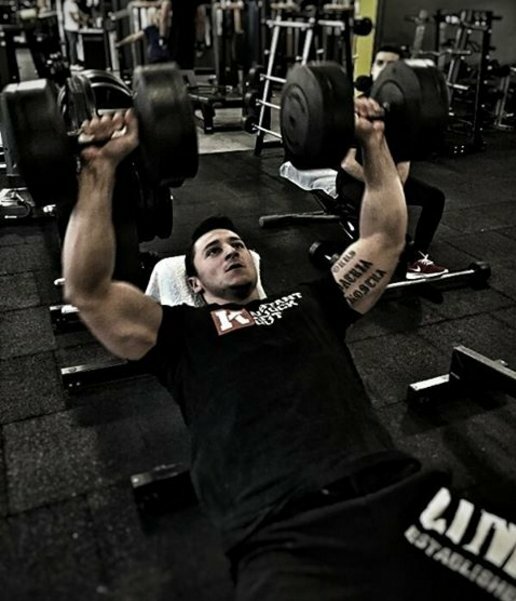 Just like you would during a massing phase, you should still be aiming to achieve fatigue on each rep and follow progressive overload. If you don’t, you’ll find that you start to get weaker – and that will have negative implications for building muscle. It definitely doesn’t need to come from a supplement, but being mindful of your daily protein intake helps you maintain more lean mass when dieting. Currently, the research suggests that aiming for around 2.4 grams of protein per kilogram of body weight on a daily basis helps you to build muscle while dropping fat when dieting . And while this sounds like a lot to achieve, even a person needing 200 grams of protein per day can get what they need with a diet rich in meat, dairy, eggs and protein-rich snacks. Who Gets The Most out of Body Recomposition Training? The bottom line is that some people will respond better than others when it comes to gaining muscle and losing fat simultaneously. Here’s who might respond to body recomposition the best. If you’re new to training your body will be primed to adapt. You might be so deconditioned that even thought of lifting weights can add an inch to your arms. But seriously though, in the first 12 months of proper strength training you’ll find that you respond much better to the stimulus of training. Your muscles will grow much quicker than if you were a well-seasoned pro. So take advantage of this window of opportunity and grab it with both hands. If you’re carrying a lot of excess body fat you’ll find that recomping is much easier, simply because your body is happier to let that fat go. If you’re over weight and a beginner then you can expect almost groundbreaking progress to begin with. This is because your body has a huge surplus of energy to use. The process of losing fat and building muscle at the same time is completely possible. It’s not easy, but it’s certainly achievable with the right diet and exercise regime. If you’re thinking of planning a body recomposition phase then take your time to set up your diet and plan a comprehensive strength program that covers all major muscle groups.